Moving furniture and appliances could be a tough job. It can cause injury and damages to your appliances and your surroundings if you’re not careful and if you don’t use the proper equipment. 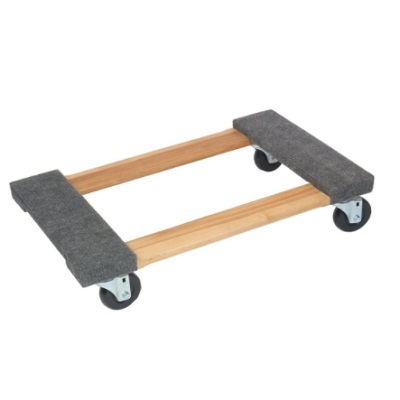 So, the next time you move heavy furniture and appliance, be very careful and make sure to use the Monster MT10003 4-wheel carpeted dolly. This piano dolly is made to be strong and sturdy and thus, it can easily support and move loads of up to 800 pounds. And even with heavy loads, you should not worry as its end rails are carpeted to protect and prevent them from slipping. It is 18 inches wide by 30 inches long fully lacquered and splinter-less carpeted dolly. Other features are headers and rails made up of hardwood and swivel caster with 4 inches wheels (non-marking). 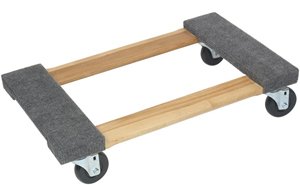 If you want to easily and safely move appliances and furniture, use MT10003 piano carpeted dolly. Order yours today. very sturdy....good price.....I will have many uses for these little gems! Worked great especially when moving a piano. Would recommend. Very sturdy. Will take the weight of a full vending machine well. Well built and high capacity for the money. Great product we think the craftsmanship with 2nd to none.